september is a great month to be a teacher in los angeles. nearly every week in the classroom is only 4 days long. today is rosh hashanah. happy jewish new years friends! how nice to be home tending to various things. i found a giant pickle jar at an art from scrap store in arcata when i was up north. wish i would have gotten all 3 of them now. they were only $2 each! the smaller bottle was in a box on the sidewalk in ferndale last spring. the sign said “free” so i helped myself. it’s perfect for the smaller shells. i’m trying to corral my beach treasure into a few containers instead of scattered across every surface. i finally got around to bottling up the water i brought back from bavaria. in case you’re wondering how i got it in my carry-on, i didn’t. it was mailed back from germany along with some other odds and ends i collected on my summer rambles in bavaria. that handsome bottle was found on etsy along with 2 more for future. i’ll seal with with wax soon. this first one is new. a print-on-demand paperback that arrived in very poor shape with some of the pages falling out, but the watercolor sketches are incredible. if you get it, don’t get the one that says, “diary”. it’s a lot cheaper, but very poor quality. the art is just fantastic though. filled to the brim with watercolor images from venice. these next 2 were found on my dusty bookshelves. this is my favorite of the 3 venice artist sketchbooks i have. i’m very drawn to her looser, more painterly style. you can’t help but want to try to copy what you see. as i’ve mentioned before, i think it’s a valid and useful form of play and study. seeing how others approach shadows, perspective, water, boats, is illuminating. venice is jam packed with scene after scene to paint. i’m going to take a smaller sketchbook i think. we’ll see. in the meantime i’ll just be here flipping through sketchbooks of mine and others. trying to figure out what my next travel journal wants to be. i hope you’re not in the path of hurricane florence! keep me posted of your ongoing adventures. see you soon! before i go check out my sister’s travel journal from our summer trip to bavaria. i am crazy about her self-portraits…and everything else! It occurred to me when pursuing this post that each photo has something to do with water. Bottles of water, droplets on plants, watercolors of water, watercolor books, watercolor palettes, flowers in water, flowers need water, seashells from water. It’s a waterful world! Oh! That took me right back to your Paris adventure. I’m not dreaming, am I, that I saw you go down some steps to scoop up some water from the Seine? Somewhere in the back of my mind, I think you showed the process of how you dipped the water vessels into the wax to seal them many years ago…I can’t remember how you kept the stopper in when you turn the bottle upside down to dip it in the wax? Or am I losing my mind? This is all a possibility! Even when you are practicing with other’s paintings to observe their style, your painting are still totally recognizable as yours. As noted, as long as credit is given, it’s a wonderful way of learning, and one that I need to remember to do a lot more myself. I think it would give me more confidence with watercolor! I am quite comfortable drawing, it’s that whole ‘adding color to it’ that still makes me afraid I’ll mess it up! Gotta put in one more shot for Donna Leon…….she doesn’t write a “detective” novel even though Brunetti is a fine one. Her novels are full of the life and color of Venice from Brunetti’s perspective as a native. He has strong opinions on Venetian politics, corruption, ecology and ethics. He is fiercely loyal and in love with his wife, Paola, a professora of English/American literature. He loves and worries about his two teenagers. They have strong feelings regarding the validity of the Catholic church. In every book, Brunetti mourns the invasion of tourists and does his best to avoid them. He finds himself facing moral dilemmas in each novel. Leon lives in Venice and Switzerland. She doesn’t sidestep the issues of her beloved Venice. I believe I read that she will not allow her books to be translated into Italian until after her death. You can view the German production of her stories on YouTube with English subtitles. Try one book, she is a terrific writer. OMG, are you going to Venice again? I have been wanting and wanting to go, but I guess not this December — it is too late now, yes? 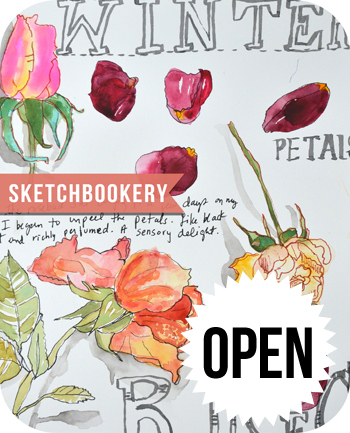 Books, flowers, sketches (both yours and Carol’s), shells (and bonus, I have some large pickle jars ready & waiting to fill with my shells)! Loved it all! Absolutely scrumptious photography! Thank you Mary Ann for years of enjoyment. Thanks for the tip on the watercolor sketchbook of Venice. I love the idea of trying to copy other people’s work. I try to be original but I think I am still at the stage where copying others is a good learning tool. I would love to go back to Venice again someday. Went two years ago and loved it. Have a ton of photos that I could be working from as well. Hi Mary Ann! I put my initial OMG! renderings on FB (Deborah Pierro) if you want to look at them. Great class! ooohhh going to look right now! I have both these books. Just bough My Venetia Schetchbook and it is gorgeous! I have all dd Borchgrave’s book and I’m in love with her work. I’ve also been collecting sketchbooks for Rome and Florence, but we’re moving and I haven’t had time to do more than peek. wait. did you say moving? i haven’t been on IG in a while. where to pray tell? full time on the cape? Have you read Donna Leon and her wonderful Comissario Guido Burnetti? There are about 14 books in the series. She is a great writer and one tends to come away with a crush on Guido after a few books (I’m just sayin’) She lives in Venice and has accurate (I am told) descriptions of walking streets and Venice communities throughout her stories. I absolutely adore your blog…inspiring!! When are you returning to Venezia?? in the heart of winter!